A Sales Account's purpose is to tell Restaurant365 what GL Account to credit when accounting for individual sales tickets imported from the POS. 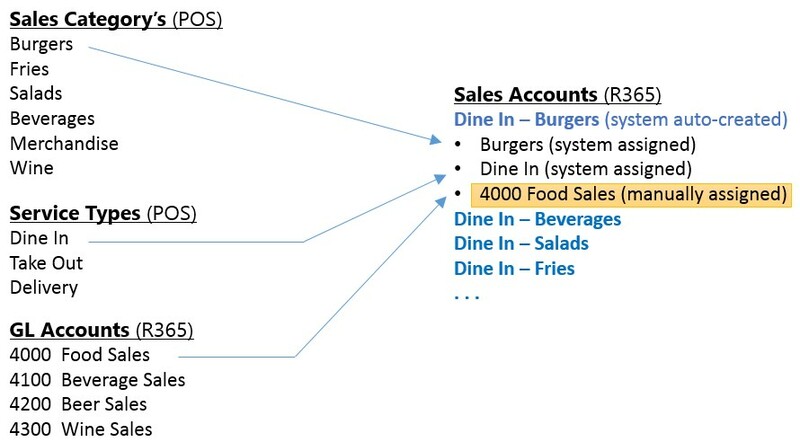 It is a 'mapping' of POS Sales Categories and POS Service Types to a Restaurant365 General Leger Account. After the initial setup, and all the Sales Accounts have been created and mapped to GL Accounts, there are occasions where new items are setup in the POS system. On the day these are used in the POS system, the Restaurant365 integration will pick these up and auto-create a new Sales Account that will need to be assigned a GL Account and flagged with the proper Sales Account Type. On the Journal Entry tab of each Daily Sales Summary transaction, there is an 'Assign' button whenever a Sales Account associated with that day is missing a GL Account. The Sales Account Setup screen can be accessed directly from the Daily Sales Summary record by clicking on the 'Assign' button highlighted below. This makes it easy to quickly assign the GL Account and then Approve the Daily Sales Summary transaction.